Something about the French cars this week – there’s generally no tie-in with the news here, and claiming that there was would be a lie, but it’s a strange coincidence that several interesting ones are available. In this case, there’s a car, and should you choose to accept it, a business plan. 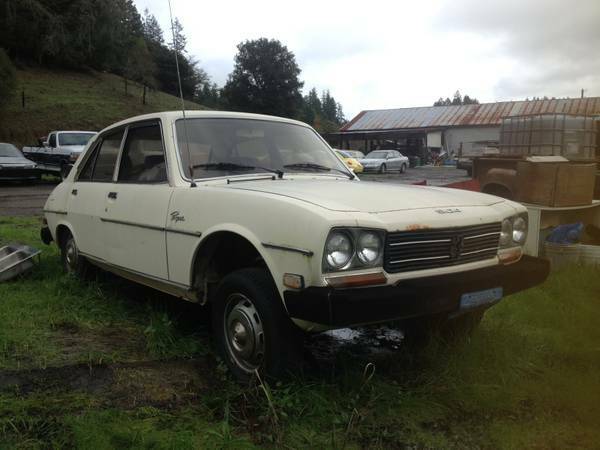 The plan goes like this: 1) Buy Peugeot 504 Diesel wagon; 2) Ship it in a container to your preferred African country, preferably a former French colony; 3) Sell the Peugeot 504 for a fat profit! What could possibly go wrong? There’s even a parts car to pad your margins with. 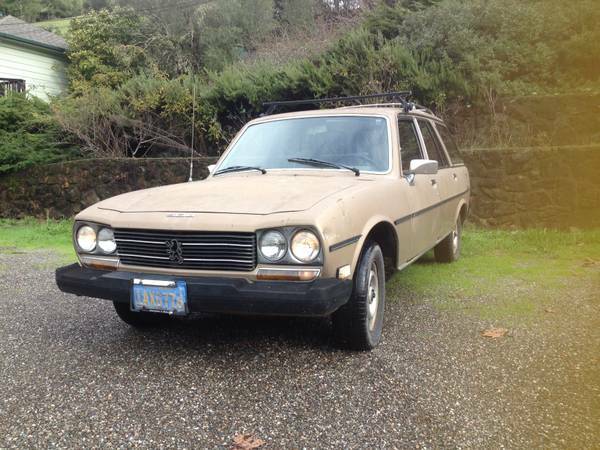 Check out this 1980 Peugeot 504 Diesel Wagon for sale for $800 in Sebastopol, CA. Compared to some of the amazing original examples that occasionally come up for sale on auction sites, this one is in nowhere near the condition, but it’s also nowhere near the price. Peugeot did a respectable job of integrating the big impact bumpers into a design that has its roots in the early 1960s, and the double-round headlights almost look better than the home market ones. But the bumper rubber is now weathered, as is the paint, and the hubcaps are missing. On that subject, isn’t it strange that Peugeot and Renault seem to have shared the same wheel design, if in different sizes? This is more or less the same wheel you can find on a Renault 5, for example. It’s understandable to share development costs on a platform, or an engine, but something as cheap and simple as a wheel seems an odd thing to share – imagine manufacturers nowadays running the same wheel on their cars, it’s inconceivable. What nastiness lurks under the seat covers, and the Mexican blanket in the back seat? 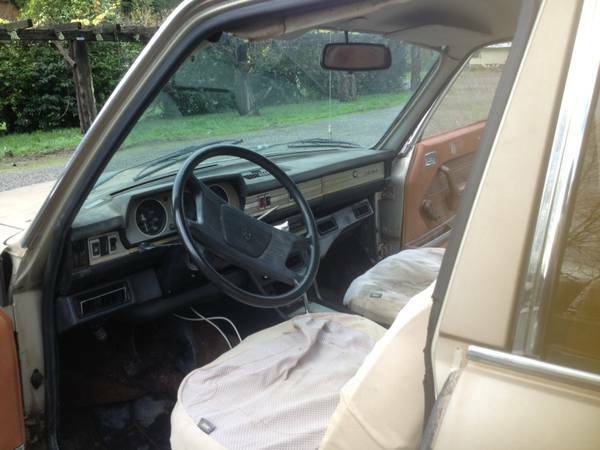 The interior looks complete, and the only concern is the pair of wires running from under the dash – hopefully that’s just lazy speaker wiring. Faux wood adds some extra style to the interior, and if the seats are intact, they’ll be some of the best you ever sat in. But wait, is that an automatic shifter? How do you feel about 30-second 0-60 runs? Perhaps the parts car has a manual you can adapt? Please? It would be interesting to see what later home-market diesels could be installed here to make the car a bit more usable. Wearing blue plates, this is likely a lifelong California car, which is good if you care about rust. And rust there is, though the only pictured rust is behind the right front wheel. With any luck, there’s none in the floors, and you’ll just have to spend some time pulling out the fender liners and scooping out a couple of cups of dirt from behind them to keep the rust from progressing too quickly. And here’s the poor parts car. Actually looking pretty decent, what’s stopping you from a) starting a fleet of Peugeot 504s, converting to biodiesel and posing them as the anti-Mercedes W123 or b) sending it off to a Nigerian prince in exchange for part of his inheritance so he can fix up his own 504? This entry was posted on January 14, 2015 at 1:13 pm and is filed under Feature. You can follow any responses to this entry through the RSS 2.0 feed. You can leave a response, or trackback from your own site. 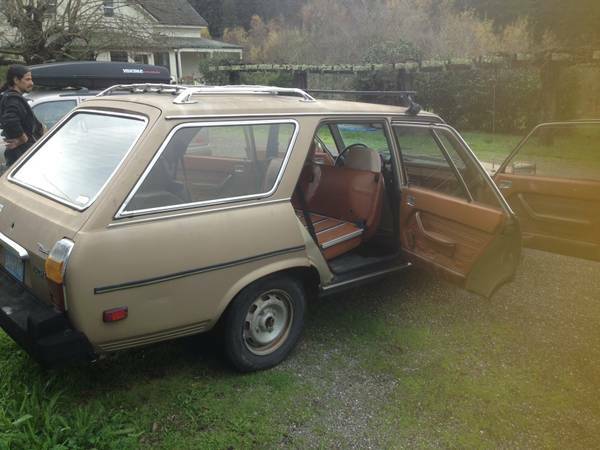 Nice looking car, the Peugeot 504 wagon. One good thing about French cars is that they make good cars. The problem with French cars is that there’s no dealer network in North America, and no service network. So if you have a vintage Peugeot diesel and it needs maintenance to keep it on the road, where do you take it? Depends where you live… in areas where they were relatively successful (the coasts, maybe some other areas of the US) it should still be possible to find repair places – there’s even one somewhere in the southeast that rebuilds 505s. Speaking from my experience with Alfas, there are usually a couple online parts houses, or worst case, ordering from France/abroad is now easier thanks to the web.